You may wonder why being a good listener at work is really valuable. 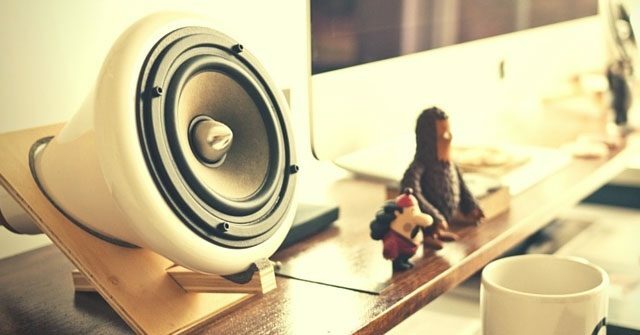 However, if you experiment with improving your workplace listening skills, you will see changes. In the fast past, high demand jobs so many of us have, really good listening may be something of a novelty. This may because of the ever-impending deadlines, the many distractions we have or the workplace stress. If you commit to being the best listener at work, you may notice that some of these challenges shift. So how might listening skills impact your work place experience? Well, consider your experience now. How well do you feel heard at work? What do you notice about people how are really present with you when communicating vs. those that are anxious to move to the next “to do”? I would imagine that when someone is really present with you that it is easier to talk to them, you may feel more connected or more at ease. What if you were that person for everyone else? How might this impact your workplace experience if people knew that when they spoke to you, that they could count on you to really pay attention? Repeating something back to someone in the way that you heard it will help to reduce miscommunication. Repeating a statement also offers the opportunity for this person to add additional clarification if necessary. This way of “active listening” ensures that this person is being understood correctly and shows them that you are paying attention. Sometimes we can get caught up in how we are going to respond to something. Thinking of what to say next reduces our ability to listen to what someone is saying. Attending to what someone is saying without focusing on how to respond will create stronger communication. Remain focused on the present moment and really digesting what it is that someone is communicating. Often times at the workplace we are moving a million miles a minute, which reduces our ability to take in information in any given moment. Taking a few moments to breath as you speak with someone will help you to be more present and process what they are saying more effectively. Before you speak or when you are feeling overwhelmed, stop and take a deep breath. This may sound trivial but can do wonders for not only stress but your ability to communicate and listen effectively. How did they work if they did at all? How long did you practice each new behavior? Based on the title you may be thinking that these things are totally un-related, but you’re here, so thank you! I lead a group therapy session a couple of times a week with about 10 attendees and the topic of animals and our connection to them recently came up. We discussed different kinds of therapy approaches, like dog therapy, or equine therapy for example. The same day I had a friend bring this topic up, which I figure is enough for me to write down some thoughts, since this is something I have experience with. 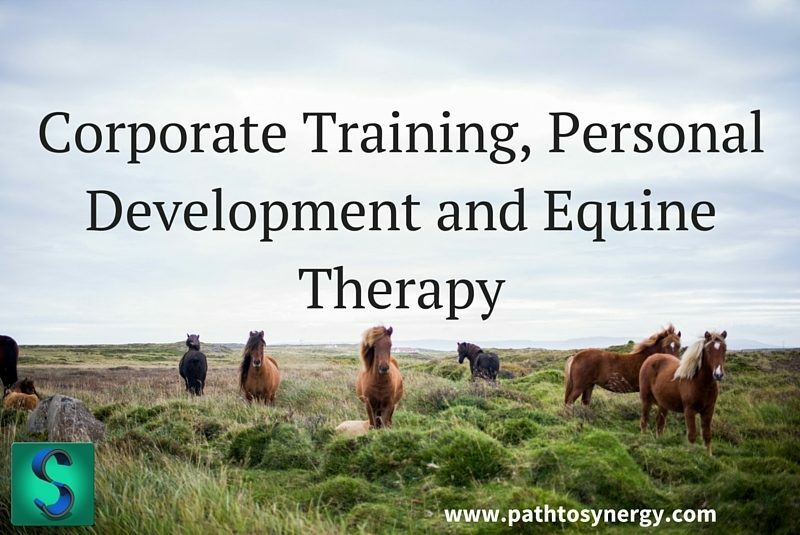 The interesting part is corporate training, personal development and equine therapy, are in fact, connected. A few years ago I went through the process of getting certified through the Equine Assisted Growth and Learning Association (EAGALA). This association is the international leader in equine training specifically for mental health and personal development purposes. What this means is that they certify psychotherapists and horse professionals, to work together to facilitate different kinds of experiential learning. These experiences can be for the purposes of individual development, individual therapy, group therapy, couples therapy or corporate/group training. So the question may be, what one thing has to do with the other? For someone that has never seen this process unfold, it may not seem like a relevant fit. The way horses and horse professionals can help to work through challenges with individuals or a group, is essentially through observation. For example, a typical Equine Assisted Psychotherapy (EAP) or Equine Assisted Learning (EAL) session, consists of the facilitators (therapist and horse professional) giving the individual or group a task to accomplish with the horse. This task could be to help move the horse through a gate, move the horse around an object or help a horse move in a direction without touching it. There are many activities/tasks that can be implemented but they are all ground activities, not requiring the participant to ride the horse. During and after these activities both the therapist and horse professional make observations of how the person or people are engaging with the horse and each other. What shows up here is powerful. Just like in experiential education, when giving a group a task to accomplish together there are markers that form organically – personality styles, communication style, natural leaders/followers, conflict and/or resolution of conflict etc. What is most interesting about the EAP/EAL process is that the horse acts as a mirror for behavior and engagement. During my time training as an EAGALA practitioner I was astounded by how fast things came to the surface through this process. For instance, when watching a family interact with an animal and attempt a task, it became immediately obvious what kinds of challenges the family had in their communication with each other. In this example it was easy to see which member wanted to control and override the input from other members of the family. This created conflict of course and made it more challenging for the family to accomplish the assigned task. Part of the feedback came from the horse as it experienced the intensity from one individual. Part of the feedback came from other members as they became frustrated with the challenge of the task, which the horse also reflected. It was powerful to watch. So how did their communication styles come up you ask? This is the value of working through an EAP/EAL program. The response you get from a horse is authentic, immediate and not bound by the same kind of bias that people have. In addition, the horse professional helps to make observation of behavior of the horse while the therapist observes how the person is engaging. Horses are able to pick up on the subtleties of behavior and intention because they are sensitive prey animals. So this means that if there is fear, anger, ease, curiosity or frustration – the horse will give feedback to these emotions/behaviors. Because the horse is so sensitive it gives immediate clues and reactions to the behaviors and intentions of individuals and groups. Some of these behaviors would be easily recognized while others are more subtle, which is why it is helpful to have a horse professional present. In the therapeutic context, understanding and processing behaviors and emotions can impact personal development and resolution of some of the challenges. At this point you may be asking if this type of intervention has any credibility from research. The answer is yes, it absolutely does. For example, one study found that well-being and reduction in psychological distress immediately improved after EAP and held stable after six months. For a more detailed look at research as it compares to traditional therapy approaches, consider this article that acts an overview and comparison. So how does this therapeutic approach have anything to do with corporate training or leadership? This is where EAL enters the picture. EAL differs from EAP in that EAL focuses more on education and learning rather than a therapeutic approach of resolving mental health issues or challenges. In an EAL setting valuable skills can be obtained that would certainly impact the effectiveness of an organization. For example, often times EAL is done with teams on an organization in order to improve communication skills, leadership or team building. This process is still facilitated by a mental health professional and horse professional, but the intention is different. In an EAL session with a team of professionals for instance, a simple task will be given to the team to accomplish with the horse. This task results in emerging behaviors and communication styles that will then be valuable for the team to later process. For instance, within a given task there may be leaders that emerge, communication that happens (or doesn’t), response style of collaboration or anger. In addition, there may be partnerships that naturally form on the team that previously did not exist or resentments that manifest that perhaps hadn’t previously. The same question may emerge regarding efficacy of this particular kind of experiential education. One of the more interesting pieces of research on EAL has to do with Emotional Intelligence, a current point of focus in many leadership and team building approaches. This research is a great review of the field of EAL as well as Emotional Intelligence. The research found positive results for EAL as an intervention for improving Emotional Intelligence. So, as we’ve seen, horses, therapy and leadership are in fact related! For more information about EAL and EAP, I recommend visiting the EAGALA website – http://www.eagala.org/. For more information on Emotional Intelligence as it relates to leadership, consider this article by Daniel Goleman. If you are interested learning more about this topic or discussing a potential workshop to build team or leadership skills, please contact us! P.S. If you are curious to learn more about personal development, workplace challenges, interpersonal dynamics, goal achievement and a wide variety of other topics, sign up today! www.www.arcintegrated.com/newsletter. It’s totally free. You’ll also receive a FREE tip sheet with Five Strategies to Build Motivation! It’s that time of year. You may have recently returned from a trip, visiting relatives, vacationing with friends or maybe just enjoying a few days off. However your holidays were spent, I hope they were rejuvenating and enjoyable. Getting back to the grind can be a challenge. I’ve certainly experienced it and I know many friends, family and clients have too. Today I want to talk about how to beat the post vacation slump! Whether the holidays were filled with fun, laughter and excitement or anxiety, busyness and overwhelm, coming back to a routine may be tough. Below you’ll find some strategies about how to get back to being at the top of your game in work and in life, in addition to some tips for the next time you go on vacation. Personal Life – This is the time for New Year’s Resolutions, woohoo! The truth is that the majority of them don’t stick. According to some data, only 8% of people accomplish their New Year’s Resolutions. However, there are many strategies on how to improve the likelihood for change that lasts. I would argue that part of the reason people don’t accomplish their resolution is that there is not enough clarity around the goal. In order to get back in work mode and also work towards new goals you have, consider outlining the details in order to build clarity. This could mean creating a yearlong vision and then working it backwards to a six month goal, a three month goal and eventually an action step you can take today! Work Life – Meetings often are less productive after many people have been out their routine or away from work. 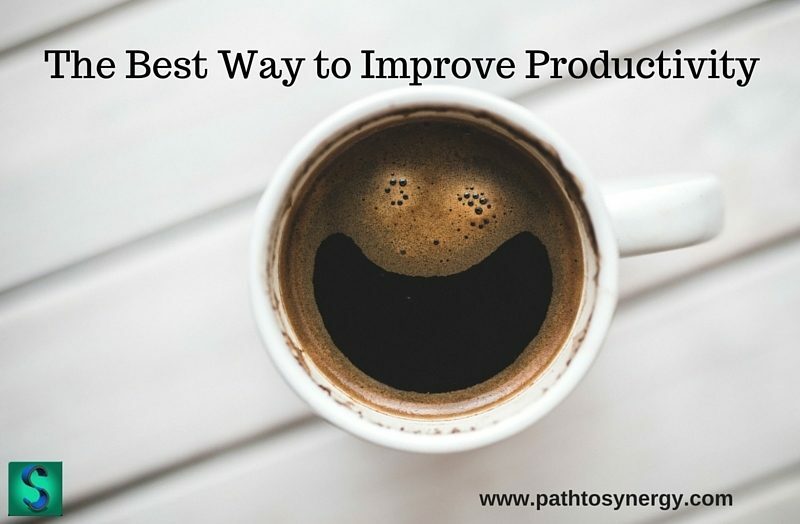 You may see less productivity in the meetings outside of work too. To remedy this, set clear expectations for what the meeting will review and accomplish and do not veer away from this objective. Make sure there are clear action steps for all members of the meetings you attend. Personal Life – In order to stay focused on our personal goals and re-engaging in our routines post-break, there needs to be some way to stay motivated. Build focus through keeping reminders around that are visible and related to your goal. Alternatively, creating a writing practice that explores the reason for working towards this goal can help to stay motivated and focused. Also, creating accountability in some way may be helpful in building focus. Accountability could be created through working through a goal with someone else or hiring a coach to help explore what is holding you back. Work Life – Lack of focus at work often shows up in the context of getting tasks accomplished or having a productive meeting. Often times meetings set out with many things to accomplish and by then end have not completed their intended outcome. Stay focused on what is most important and do not add too much to the meeting, always expect that things may take longer than anticipated. Have no more than three main objectives per day that are on your “must complete” list. Personal Life – Reaching goals is all about combing process and product. It’s great to read self-help books, follow thought leaders, or engage in philosophical debate about mindset, intention and positivity. The next step is combing all of this wonderful theory with small steps in the right direction. Keep in mind that these steps can be small, but should be consistent. Keeping after deadlines and continuing with actions items after exploring ideas will lead to progress. Work Life – The same issues exists in the work world when we have meetings or discussions around an idea. Ideas often need to be translated. People feel that meetings are a waste of time when there is no clear outcome, objective or “to do” item. Always be clear about expectations for all attendees. Have attendees commit to their particular action item as well as deadline so everyone is clear on each person’s objective. Work Life – Getting back into a routine is easier to do with work when it isn’t totally avoided during a break. This certainly doesn’t mean you have to be checking email every day or doing work on vacation….that is definitely not recommended. But keeping sleeping in to a minimum may be helpful when it’s time to get back to work. Also, reading while on vacation may help to keep your mind active and productive so that it may be easier to re-engage when its time. Personal Life – I hold the firm belief that we are much more capable than we often give ourselves credit for, in every sense. Care to experiment with this idea? Try pushing yourself past the invisible finish line that you’ve set for yourself. Go to the extra class, read the extra chapter, do another set, run the extra mile, take the risk in a relationship. Make a consistent effort to go past your comfort zone, you’ll be surprised what you learn. Work Life – The same concept of going past where we think we are capable of applies to work. Consider how much you get done in the typical day and see if you can double it. No, I don’t recommend working 16 hours instead of eight. Working more efficiently and pushing past some of the self-set boundaries is a better (and healthier) experiment to try. Consider how much time you spend during the average day being distracted by non-work related issues or work that doesn’t necessarily make you more productive but makes you busier. Evaluate how to be the most productive version of yourself and push out any limiting beliefs that may have held you back previously regarding how much you could accomplish in a day. Personal Life – This time of year is a great time for downsizing, clearing out, resetting, cleansing and letting go. What has been serving you this last year and what no longer helps you to become the best version of yourself? You can pose this question to any facet of your personal life from your relationships to your diet to how you spend your time. Evaluating the different aspects of your personal life allows you to set clearer goals and intentions for the year ahead and also helps to come back stronger from time off. Work Life – Is the job you’re in the one you want to be in? Taking the time to evaluate how much you are really committed to the work you are doing can be a helpful way to not only improve your re-engagement post vacation, but also help you make changes to your current situation. If you are certain the work you’re in is for you, great! Take the opportunity to evaluate how you will make this coming year a better one than the previous. If you determine that your purpose is elsewhere, come up with an exit strategy. Outline your strengths, objectives and timelines. This will help make the rest of your time in your current position not seem as daunting. Pick one of the strategies above and take action! Just one. After you’ve experimented for one week, come back and leave a comment below and share what you learned. Let’s help each other make significant changes this year! https://www.arcintegrated.com/wp-content/uploads/2017/06/Beat-the-Post-Vacation-Slump.jpg 570 800 Michael https://www.arcintegrated.com/wp-content/uploads/2017/06/AI_logo_notagline_72dpi-01-300x140.png Michael2016-01-15 00:00:002017-08-10 16:42:40Beat the Post Vacation Slump! Getting frustrated at work is common. However, how you express it or don’t, may greatly influence the environment that you’re in, as well as future opportunity. 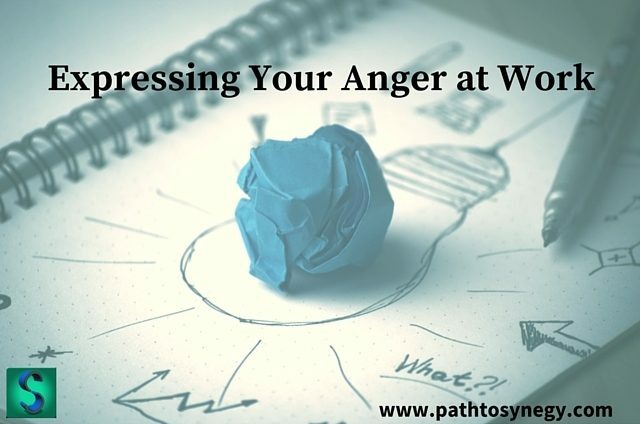 While expressing your anger at work may be generally frowned upon, there are certainly strategies that will help with this process. Consider these three tips below when expressing your anger at work. Timing is important – Remember that when you are anger this may not be the time to resolve an issue. However, coming back to a situation after decompressing and letting the parties involved know how it impacted you will allow you to be a better communicator and express the importance of the situation, improving the likelihood of resolution. Understand what helps you decompress – Having an understanding of what kinds of strategies are most effective for you in reducing anger is important. This may be walking, exercise, writing, listening to music or a wide variety of other things. Taking the time to explore what works best will benefit you in the long run and give you the chance to effectively express and reduce anger instead of letting it become a problem. Remember the context – This is a very important component. Even though telling someone exactly how you feel may seem like the best idea at the time, the context may suggest otherwise. Being mindful of how and where you are expressing anger, if at all, may be a very important factor to consider. The better question to ask may be how to reduce anger in general. Understanding how to control our feelings may be beneficial in many different environments. Having the ability to respond to events rather than react, may serve us well. If we know how to control our sense of reactivity then we may respond in a more appropriate way. Understanding ourselves, how we respond/react and triggers that we have, may involve some self-exploration. Interestingly, the expression of anger may be totally culturally contextual anyway. In our culture we tend to look at the expression of anger to be generally unfavorable. In other cultures expression of anger may actually be of health benefit. In a study by The Association for Psychological Science, they found that expression of anger in Japanese culture was associated with better biological health. This suggests that anger isn’t necessarily positive or negative but the meaning that it is applied to it may impact the results of its expression. This idea of exploring our anger to identify what kind of meaning we apply to it may give us another reason for self-exploration. Certainly the negative or positive consequences of expressing anger are still being studied. In the meantime, we do know that improving our understanding of self and how we respond and react can have a great impact on our work and home environments. If you are curious to learn more about personal development, workplace challenges, interpersonal dynamics, goal achievement and a wide variety of other topics, sign up today! www.www.arcintegrated.com/newsletter. It’s totally free. In a featured article within Askmen.com titled Ways Relationships are like Business we explored the human side of business. 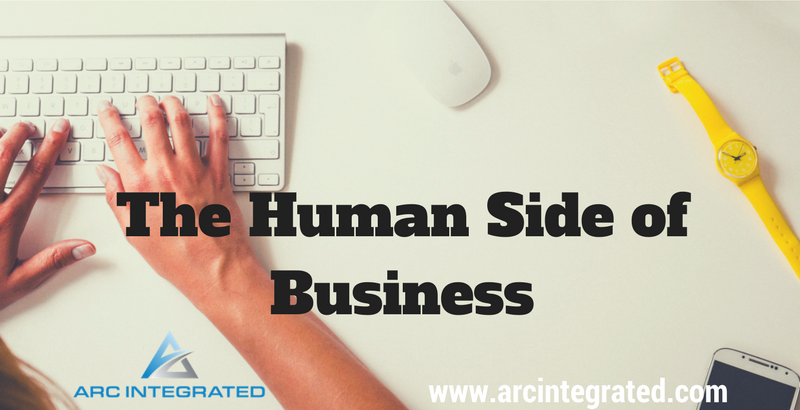 The idea of businesses having more to do with people, relationships, connection and communication is a cornerstone of the work we do at Arc Integrated. Please see three ideas below on how relationships are like business. You’ll have to watch the video for how to apply these ideas. How have you seen the human side of the business you are involved in impact the success or struggle of that business? What other examples can you provide regarding the commonalities between business and relationships? What is one thing you would change about the interpersonal dynamics of your workplace? Of course this is a complicated question, but fun to answer. My answer consisted of ways to build inspiration, courage, congruence etc. I wondered though, how does one hold on to inspiration? I want to take this opportunity to discuss not only how to hold inspiration but particularly how to hold inspiration and engagement in the workplace, where most of us spend the majority of our time. Employee turnover is expensive, unproductive and challenging. Keeping employees engaged and enthusiastic about their work will reduce employee turnover and ultimately reduce costs and lost productivity for the company. Understanding the match between the company’s values and employee’s values is important. If this is unclear, consider bringing in consultants or coaches that can evaluate and mediate this discussion. So this may pose the question – how does a company get leadership to buy into this importance of employee engagement? Companies can encourage leadership to understand the importance of employee engagement through modeling it. This means that HR and executive leaders should feel engaged in their work so that they can experience the value of what they will be teaching to other leaders in the company. If leaders are experiencing a congruence between the values of the company and their own values, this will certainly inspire employees in the workplace. This does seem relatively intuitive in nature, that if values match then positive outcomes will result. However, now there is a building mountain of evidence to support the importance of engagement, value alignment and inspired employees, as it relates to the successful business. For example, according to Towers Watson, companies with a highly engaged workforce improved operating income by 19.2% over a 12 month period while companies with lower engagement saw a 32.7% decrease in operating income. However, according to a study by Accenture, less than 50% of chief financial officers appear to understand the return on investment in human capital. Even though this may be changing, continued awareness is important. For additional evidence regarding the value of addressing engagement and other human dynamic issues, here is an extensive list of studies pointing to the value of improving employee engagement, culture and satisfaction. How is your current level of engagement in your work? What would it take to inspire you? 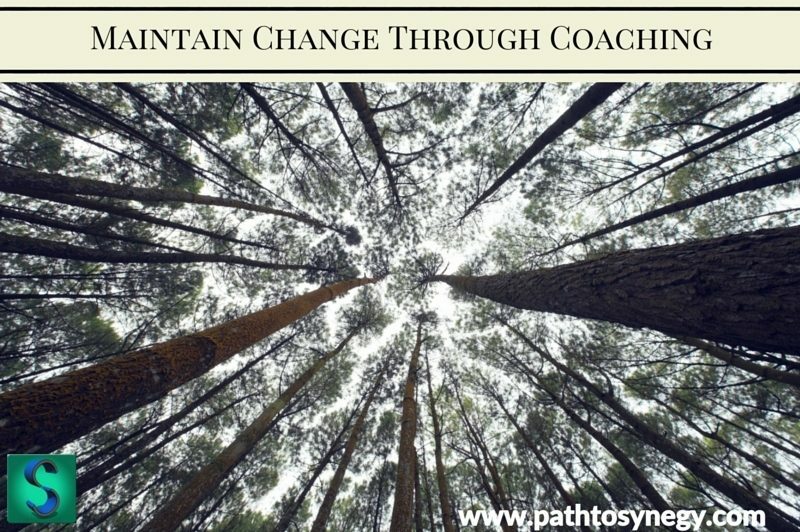 I was thinking recently about my own personal philosophy about how to really maintain change when searching for it, as well as how I bring this philosophy into my coaching practice. As with most things I do, I take a holistic approach, which is the same for my coaching philosophy. The following ideas can be taken as a guide to maintain change through coaching as well as a guide to understand how I work as a coach. When working towards change, particularly when it comes to personal development, it is important to see all the aspects that may be helping or hurting progress. We are complicated creatures. Working towards the best version of ourselves is not just about thinking in a different way or practicing good habits (although these are pieces of the puzzle). True change comes from evaluating all the aspects of our human experience. When we look through all of our different lenses, we have the greatest likelihood for success. We need to explore how we think, feel, act, take care of ourselves, strengths we have as well what/who we surround ourselves with. Cognition – The way we think. Do you analyze, make decisions quickly, not quickly enough, make strong judgments, think poorly of yourself or too highly perhaps? Both the way we think and what we focus on may be impacting our ability to change. Heart – How we feel. Our emotions play a big part in our ability to be successful. If we can remain confident, happy, grateful, curious and positive then we may have a greater chance to work towards change. If we are negative, depressed, sad, angry, overly reactive or closed off from our emotions we may have a harder time moving towards the change we are working on. How we feel can also be related to our relationships and how they impact our ability to change. Action – Habits and routines play a big role in our ability to change. Thinking and feeling are important but it is the actions that we take that impact how our feelings and thoughts change. Our action or inaction can play a big role in our ability to push things forward towards our desired outcome. Nourishment – How we take care of ourselves. It is not news that the way we eat, how much we exercise, and our general lifestyle all impact multiple facets of our lives. This is the same for any change we are after. How we treat our body impacts our motivation, energy, creativity, strength and focus. Considering how we are nourishing ourselves is important. Greatness – What are your strengths, purpose, and passion? This is what makes up your greatness. Exploring what is great about you not only leads to creating better leadership but also fulfillment, higher energy, better coping methods and a happier lifestyle. Environment – What we surround ourselves with. I believe it was Jim Rohn who originally quoted – “We are the average of the 5 people we spend the most time with.” This is a powerful quote and I believe it to be relevant. When it comes to our own development, our environment goes beyond the people we are around. Our environment could be our family, work, our city, community, or how our house looks and feels. For example, if you know you function at a higher level when things are organized then keeping your house clean and in order may be an important factor in your own development. All of these factors within the CHANGE acronym are important to explore during coaching. When I work with clients this is part of the process I take them through. My belief is that unless we focus on all of the potential areas that may be influencing our ability to make a change then we are leaving opportunity on the table. It is also important to remember that any change one may be working towards takes time. Remember that there is a particular pace that change takes. Be kind to yourself along the way. I was recently with a client and we were discussing coping methods. Coping methods are ways to deal with challenges that we face as well as ways we can help to reduce troublesome symptoms we are dealing with. There are many traditional coping strategies – breathing techniques, exercise, meditation, walking, art, distraction methods, spending time with others etc. Some of these techniques work well for some people while other techniques just don’t seem to fit. In my experience, the ultimate coping method is always the one that is most in line with the individual. This means that for a coping strategy to be most effective it has to connect with the person’s passion or purpose. 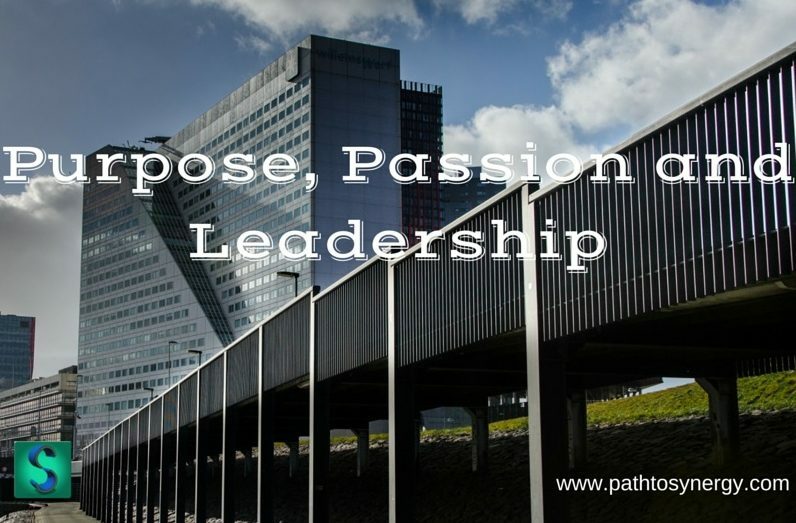 What I want to address today is how passion and purpose is connected to leadership. So what do mental health coping methods have to do with leadership? More than you think. Leadership is in the midst of a shift. This is mostly well known, however, old ways of leading still seem to be prevalent within some organizations. What we are finding through research and effective training programs is that true leadership comes from inspiration, not from authoritarian demands or unapproachable hierarchy that pushes work downstream without consideration of how it impacts others. True leaders are followed by those that are happy to be working for them because they feel inspired to do so. Effective leaders build the next generation of leaders within any system and work in a way that is fueled by purpose and resonance with the mission at hand. According to research by the Center for Creative Leadership, survey results show that 84% of respondents in organizations see leadership changing in the last 10 years. The focus is shifting from an individual outcomes perspective to that of collaboration, teamwork and longer term objectives. Another article by HR Magazine emphasizes that leadership is shifting towards less hierarchy and more inclusiveness and understanding of the needs of others. To build an inclusive environment, one needs to lead through effective listening, empathy and to be leading through inspiration rather than demand. Even in some environments where leadership may looked at as a harsher more demand oriented situation, this is not always the case. For example, I was recently listening to one of Tim Ferriss’s podcast interviews where he interviewed General Stan McChrystal about his experience in the military. One of the questions was regarding what was one of General McChrystal’s pet peeves about how military life is depicted in the media. His answer was great! General McChrystal went on to discuss how even though he knew the stereotypical “hard” leaders in the military, that were cold, demanding and difficult to approach, this type of leader was less common. He went on to report that the most effective leaders, and the majority, led by inspiring their teams and those they were leading. How do we build leaders that inspire? One answer to this is found in the search for finding ones ideal coping method. To be able to lead through inspiration means leaders have to understand what inspires them. Being inspirational is achieved through truly knowing your own passion and purpose and then pursuing it. Through creating congruence between what we value and how it is being expressed, we can explore our passion and purpose. The days of “do what I say not what I do” are fading away. Understanding what we are passionate about not only gives us an opportunity to be better leaders but also helps us to cope with stress and challenges more effectively. If we combine our contagious passion with our ability to self-regulate, people will be truly inspired. Finding ones passion and purpose may be complicated. We may have some passions that are present in our professional lives and some that are more active in our non-work life. For instance, an organizational leader may have a passion for sales in the work world but also have a passion for lifting weights in his non-work life. This person may also know that they function at a higher level when they are actively pursuing both passions, in a sales role at work while using weight lifting as their non-work passion. This example of weight lifting may be this person’s coping strategy in dealing with work stress, conflict or anxiety. This person’s pursuit of this coping method not only impacts their ability to function outside of work, but makes them happier and more productive while in their work role. Understanding what we are passionate about in and outside of work is important – and certainly impactful in both directions. Focusing on our strengths and where we exceed, in addition to tapping into what helps us stay balanced, will create a great expression of our passion and purpose, and allow us to become true leaders. What is your passion or purpose? How do you actively pursue it?